I've been going through a phase with the garden. All spring I loved it, and when I started working long hours I missed it terribly. Then as summer set in, it just got to be a lot of work. The weeds I'd laboured for hours to remove came back, the watering system kept breaking in odd ways, I didn't have enough time outside of work to keep up with it, and mostly it just got really overwhelming. I stopped being excited to go out and work on projects, because there were so many major things to do that it wasn't as much fun. I think if I'd been gardening for a shorter time, I'd have lost all interest and given it up. But the truth is that I go through phases like this on a regular basis, so I knew it would come to an end and I'd be back in love with the garden again, soon. That is Coreopsis tinctoria 'Mahogany', one of the many plants I picked up at Annie's last weekend. Coreopsis is a real champ in this climate, and I am looking forward to it blooming all winter long as advertised. This Veronica isn't blooming yet, and I don't expect it to any time soon, but it's looking awesome since I planted it last week. This is along the path into the orchard, where I'd really like a plant to grow wildly and cover up the retaining wall stones. This area has been pretty stark this summer, and I have plans to fill it with flowers for next year. I still have a lot of plants to get in the ground, waiting on some massive weeding projects I haven't gotten started. I'd like to do a bunch of work out front, but there're lots of plants to be moved (I'm relocating some of the lavenders) and there's a large section of planting bed that needs to be hacked at before I dare try to plant anything else there. Along the West fence in the back is one of the areas I have been despairing over. Weeds just grow like mad (the photo shows a Montmorency cherry tree, a Salvia apiana, and a lot of invasive ferns, canna, mint, and Bermuda grass from next door; somewhere behind all those weeds is a sad little hollyhock). I've been keeping cardboard down to try to smother them, but most of the weeds are Bermuda grass which pretty much just laughs at the cardboard. I have a devious plan for using my backpack sprayer and some Roundup to solve this little garden issue. October is the prime time for spraying Bermuda grass with glyphosate, because the plant is in a heavy storage phase. I just need to get the dogs out of the way. And speaking of dogs, I was wondering why some of the strawberries never seemed to perk up no matter how much water I gave them. I think I have the answer for that. They don't call it a strawberry "bed" for nothing! 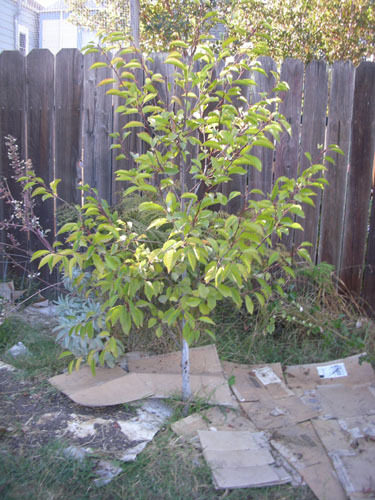 This really resonates with me: "The weeds I'd laboured for hours to remove came back." And how. 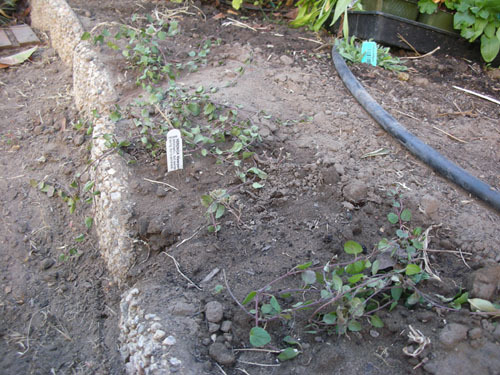 I was so vigilant with the bindweed in the vegetable garden, and then one day, boom, it was everywhere and I just said, aw, screw it. There's always next year. 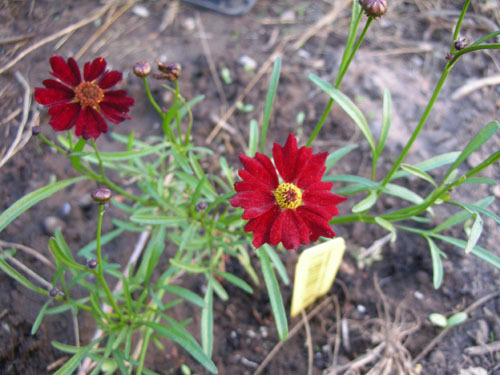 The coreopsis is nice, isn't it? I think gardening in a year-round climate is a lot harder, in many ways, than when I gardened in New England. You just don't get that nice killing freeze that knocks back the weeds to sensible levels. Instead, winter is basically the season when your weeds get watered a lot. 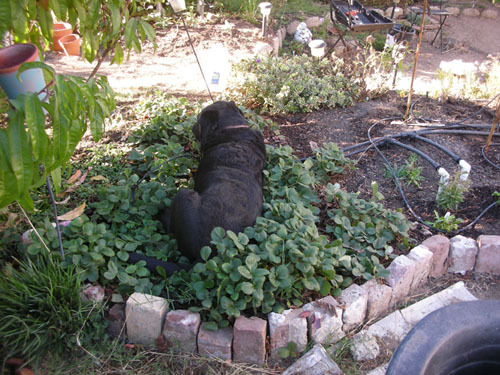 Strawberry beds are the perfect lounge for doggies... That's a great picture.